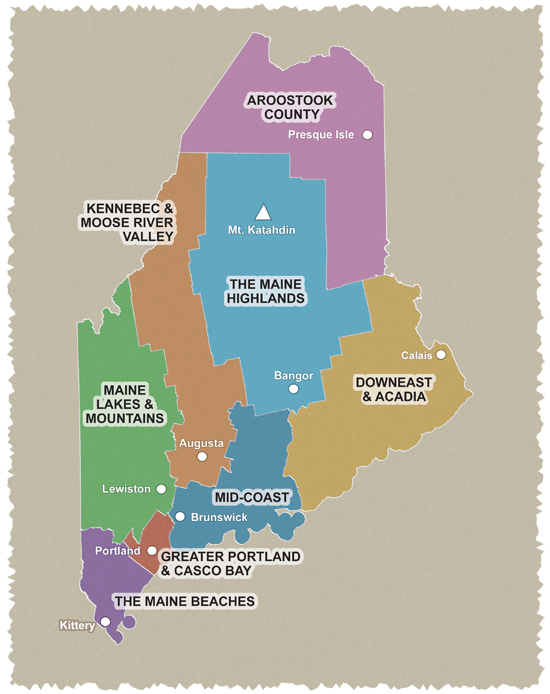 Medway (the starting point for these rides) is 11 miles from Millinocket, gateway to one of the largest wilderness areas in the country—Maine's north woods. This multimillion-acre region is home to Baxter State Park, whitewater rafting opportunities, hundreds of pristine lakes and rivers, and numerous wildlife. It’s incredible that this natural, unspoiled environment is just off I-95. All three rides go along the west branch of the Penobscot River and pass by rural farms, forests, and logging communities. You will see views of Mt. Katahdin on the 68-mile ride. Road conditions: Generally fair to good. Watch for broken pavement. Cautions: Logging trucks are common on roads in this area. Watch out for them. Some roads have no shoulders. Starting point: All three rides begin at the Roy L. Powers Recreational Area parking lot on ME 157 in Medway. Take Exit 244 off I-95. Starting point is less than 2 miles west of exit. Although the Park Loop Road in Baxter State Park is not part of the tour, Tour 3 is close (half-hour drive) to the southern entrance to the park. The Park Loop Road is gravel through the entire length of the park. The road can be dusty or muddy depending on the season. Bicycling is not allowed in any other part of the park. This is a remote wilderness area with few services available. Therefore, planning ahead is very important. Take basic tools, spare parts, warm clothing, food, water, etc. It is also important to make reservations well in advance if planning to camp in the park. Several commercial campgrounds are available just outside the park perimeter. For more information on the park’s services, attractions, limitations, and maps, contact the Baxter State Park: www.baxterstateparkauthority.com or call: 207-723-5140.